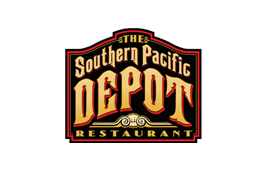 The Southern Pacific Depot serves grilled steaks, fresh fish, lobster, oysters, cocktails and fine wine in a remarkable setting: a 1916 train station featuring stained glass, historic photos and elegant chandeliers. Within these walls, we pay tribute to the golden age of travel with fine dining, elegant surroundings and abundant elements of history. Never miss an event or special announcement! Join our e-news community and get the latest information sent directly to your inbox. "The Depot should be great; it's managed by the same family that owns and operates the award-winning Vintage Press! Known as a watering hole for locals, the old railroad depot was not the place you'd go to impress anyone. But now, it's now a 5-star restaurant with superb meals and first class service!" Be part of our growing community. Connect with us on Instagram and Facebook! Tag a friend and bring them, too! Whether you live in the Central Valley or are visiting Visalia to enjoy the beautiful surroundings and amenities, we've got a choice of restaurants and unique dining experiences sure to please. We look forward to seeing you soon!